Wood floors add warmth and beauty to your home. They increase resale value and lend an elegant feel to any room. Wood is a great option to reduce allergens in the home as it does not trap dust or fumes. It is sanitary and easier to clean than any other floor covering. With the range of species, colors and grain patterns available today, everyone can find a wood floor that will fit their style. Solid wood flooring is milled from a single 3/4" thick piece of hardwood. Common hardwoods include: Red and White Oak, Ash, American Cherry, Hickory and Maple. Solid wood floors must be nailed down, and can be refinished several times - giving them a very long life. These are produced by laminating several hardwood layers together to form planks. These floors can be glued down, stapled down or floated over a variety of subfloors. There are many exotic varieties of flooring available today that are gaining popularity. These are generally more expensive than domestic hardwoods. Some exotic species to check out are: Rosewood, Purple Heart, Tigerwood, Santos Mahogany, Brazilian Cherry, Cork and Eucalyptus. These will add flare to any room! 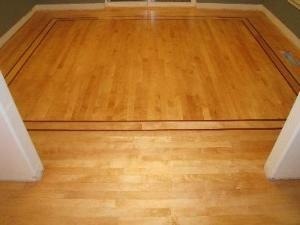 Unfinished floors require several steps to completion: installation, sanding, staining and finishing. The benefits of finishing in place are that the floor is leveled in the sanding process, and you can customize it by choosing the type of stain and finish that you prefer. Prefinished floors can be installed and completely usable within a day. We have found that prefinished wood floors are durable and for customers looking to save time and reduce installation mess, they are perfect. Prefinished floors also come with a factory finish warranty. When choosing your stain color you should keep in mind that dark stains are more common in traditional or formal rooms. Lighter stains are used more often in casual or country style interiors. Your wood floor should either compliment or contrast your existing cabinetry and furniture. There is a large variety of finishes available to achieve the look that you desire. We have applied them all, from traditional Swedish finishes to the the much less toxic water based finishes, which we recommend. There are heavier finishes for high traffic areas (more expensive), and lighter finishes for other areas. To help determine what type of finish you have on your floor use these tests. If the floor was installed in or before the 1960's you can assume the finish is a varnish or shellac. To test this, scratch the surface with a coin in an inconspicuous place. If the finish flakes, it is a shellac or varnish. These finishes are not used anymore, and require sanding to bare wood before refinishing. To check if your floor has a wax finish, find an inconspicuous area and apply some drops of water. If white spots appear under the water in about 10 minutes, your floor has a wax finish. If the finish does not flake and white spots do not appear, then the floor has a surface finish. Here is a link to the National Wood Flooring Associations Design A Room Program. It is free, fun, and may help you decide on your flooring. Another helpful tool is the Janka Wood Hardness Scale - harder wood floors hold up better in general, but with care and proper cleaning softer woods can look beautiful for many years.